Mandy graduated from the European School of Osteopathy in 2009. 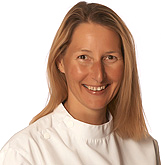 Before moving to Guernsey, Mandy worked in Cambridge at ‘The Osteopathic Centre for Family and Children’, and in the South East of England in a multidisciplinary clinic working with podiatrists and acupuncturists. She has also been an assistant lecturer at the London School of Osteopathy. Prior to her osteopathic career, she worked for 9 years in the fitness industry as a personal trainer and remedial massage therapist, and also lectured in personal training. She is presently undertaking a Master’s degree in Sports and Rehabilitation. Mandy enjoys all aspects of being an osteopath. She has a particular interest and experience in treating patients who have been in accidents and have had traumas. She also enjoys treating sports injuries, children and babies, pregnant and postnatal women. Mandy is based at St Martin’s Surgery.